We’ve lived in Chapel Hill seven and a half years and there are two places where my husband is known by name: the local Harris Teeter and the Chapel Hill Wine Company. Needless to say, my husband Tom is a better shopper than me. He can stretch a hundred dollars into ten paper bags of food and a week of menus. As for me, the same hundred dollars might yield three paper bags and a struggle to string together two good meals. While I’ve never understood this phenomenon, I’m greatly appreciative of Tom’s shopping skills and happy to allow him the honor of buying enough food to feed our four starving sons. It all boils down to the concept of division of labor. He buys the food and I applaud him — or something like that. While this may explain Tom’s fame at the local grocery store, the wine company requires further examination. This past Saturday, our usual schedule was disturbed by a few non-standard activities involving two of our sons. As a result, I ended up accompanying hubby during some of his Saturday errands. We started at 3 Cups where we attended a wine tasting and examined their coffee bean offerings. We then hopped over to A Southern Season where we bought coffee, tea, cheese, prosciutto, and chocolates. It was then that hubby mentioned he had a case of wine to pick up from the Chapel Hill Wine Company. “Wait a minute,” I began. “Didn’t you tell me last month that you bought your last case for the year?” It was a legitimate question since we had agreed on a 2011 wine budget; one which had already been met, and we had the wines in the cellar to prove it. Something told me he wasn’t being complete truthful; but, I’ve known the wine company to offer case deals before the wine arrived, so I accepted his answer without further question. Besides, the truth came out the moment we walked into the store. “Hello, Mr. Bishop! Are we holding a case for you?” asked the man behind the counter. “Oh, yeah but I think that case was on back order from a couple of months ago,” Tom responded with a nervous laugh. I gave him a suspicious glance over my shoulder. “No, according to my records, you ordered this case last week,” the clerk cheerfully offered. I did an about-face and glared at both men. The clerk, having apparently played this game before, quickly assured me that whatever Mr. Bishop said was the absolute gospel. “Uh-huh, right,” I mumbled as I turned to find my own good bottle. 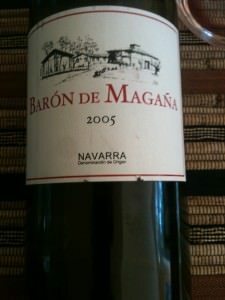 I settled on the Baron de Magana, a Spanish blend of Merlot, Cab and Tempranillo, described as having a Bordeaux-like perfume of toasty oak, pencil lead, spice box and black currants. While not sure about the pencil lead, the rest sounded quite nice. I placed my bottle next to the case on the counter. “No need to get that one,” Tom informed me. “I’ve got a bottle of 2005 that’s been aging on the bottom shelf for the last couple of years. I’ll open it tonight, just for you!” he said with a wink. 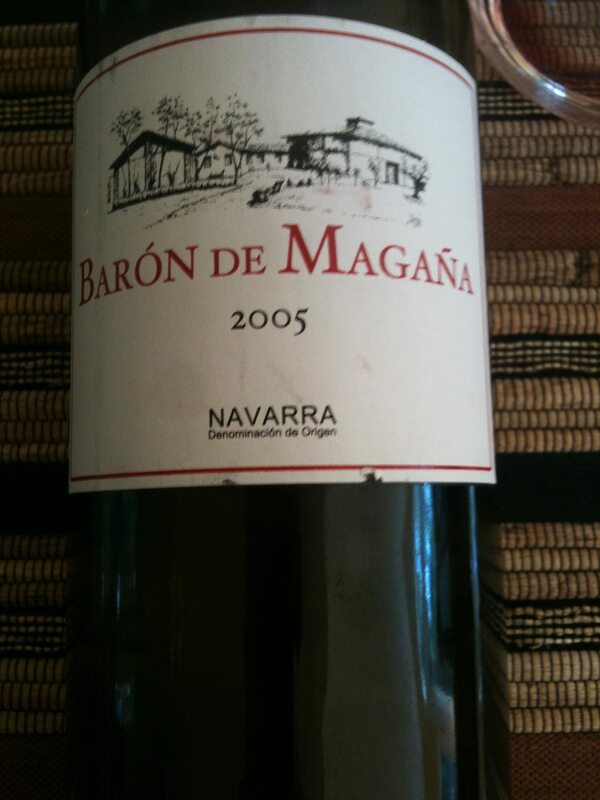 I think I can forget the events from today… But only if hubby orders a few more bottles of this Spanish delight!